We’d love your help. Let us know what’s wrong with this preview of Orange Petals in a Storm by Niamh Clune. A bedraggled and bruised eleven-year-old child races through rain-drenched East London streets as though the hounds of hell were after her. She tries to reach the home of her childhood, a home that was hers until her mother's recent death. What becomes of Skyla McFee once she arrives there? And from whom does she run? This is a story about a wonderful child who endures great suffering at the hands of her step-father. Though she lives in a harsh reality, she evolves spiritually despite, or perhaps because of the hurt she suffers. The magical way she transcends her unbearable life through her inner world transports us into the hauntingly beautiful dream-world of the imagination. There, she discovers an inner strength and wonderful talent that helps her to overcome her tormentors. Niamh Clune gained her Ph.D in Educational Psychology from Surrey University U.K. Born in Dublin, Niamh is a writer, poet, environmental campaigner and musician. She loves teaching and inspiring people, especially little ones and believes that reading to children, even before they can understand words, teaches them to associate books with love and affection. Part 2 of the Skyla McFee Series will be coming soon to Amazon. The Coming Of The Feminine Christ: (Non-Fiction) The Coming Of The Feminine Christ: (Non-Fiction) is a personal meander through a rich tapestry of myth, psychology, philosophy and mysticism to uncover a new dynamic spiritual message for the age in which we live now. Knowledge is power ~ and self-knowledge is the power to our success in every aspect of our lives. The wisdom in this special book will help us claim what is rightfully and naturally ours. Dr. Niamh Clune takes us on a unique inner journey ~ one that breaks down barriers to self-knowledge and offers keys to unlocking inner wisdom. She inspires the use of the creative, spiritual imagination for dealing with our worldly problems. The beautifully written Coming of the Feminine Christ has become a new guiding light for the 21st century for many people who are on their own journey of transformation and personal development. To ask other readers questions about Orange Petals in a Storm, please sign up. Orange Petals in a Storm is a well-written novel with a fairytale quality. Orphaned and left with her stepfather who cares only for her inheritance, Skyla faces daily ridicule and abuse from her two wicked stepsisters. Grandmothers are supposed to be sweet and caring, even step-grandmothers, but not this one. A master at manipulation, Skyla’s step-grandmother gives veiled and not-so-veiled threats to keep Skyla from revealing the mistreatment and to squash any thoughts of trying to run away. You’l Orange Petals in a Storm is a well-written novel with a fairytale quality. Orphaned and left with her stepfather who cares only for her inheritance, Skyla faces daily ridicule and abuse from her two wicked stepsisters. You’ll fall in love with Skyla. She’s a sweet young girl seeking to survive the harshness of her life. Finding herself incapable of physically escaping, Skyla escapes mentally into a mystical world. She is joined there by the Mick, the cat. Together they seek to right the many wrongs in their real world. It’s a a new twist on an old story line. It’s a story of good overcoming evil. It’s a story of perseverance in well-doing. It is sad, yet joyful. Your heart will weep for Skyla. You will feel her vulnerability and marvel at her strength. With wisdom beyond her years, she sees the root problems that bring about perpetuated abuse—and she gently pushes change through. You’ll be cheering Skyla on as she brings about positive change in the lives of others, all the while hoping to see a change in her tragic circumstances. Orange Petals in a Storm, by Niamh Clune. First Published in 2011, Niamh Clune, publisher. Ever since Charles Perrault’s Cendrillon in 1697, and previously, I’m sure, there have been tales of young women portrayed as flowers living among the thorns. As awakened authors write to impart self-awareness on society, in an effort to raise our consciousness or simply have us remember, tales of heroes born of hardship emerge, bringing hope and renewed belief in our human cohorts. Niamh Clune, being such an author, delivers a moving tale in: Orange Petals in a Storm. Narrated from an omniscient point of view, Clune describes Skyla McFee’s brush with assault and abuse, in tender strides, her style reminiscent of Antoine de Saint-Exupéry’s panache in the fabled, Little Prince. Grace, attention to detail, and the hesitant ramblings of an eleven-year-old mind set the mood, helping us recapture our own delicate youths. Story opens on the mystery of Skyla plodding through the streets of East London. “Those in the warm safety of their cars … might indeed have wondered what she was doing there mud-stained and alone…” The author cleverly lets us know that our curiosity, unlike that of those drivers, will be sated, and we feel compelled to read on. In a timely fashion, characters are introduced to complete the picture of Skyla's world. By the time the family she lives with becomes second nature to the reader, having us squirm to reach into the book and physically pluck Skyla from their grasp, Clune introduces a potent ingredient to the plot, a seasoning that not only renders her story unique and refreshing, but teaches us all a lesson on the power and influence of a child’s imagination. The chapters devoted to Skyla's inner mind actually brought me back to my own childhood, and I suspect the author delved into her own memories in order to bring such authenticity to Sarah’s thoughts. Gram is quite the character and sticks in my mind. At times she cajoles, and at times she scolds while appearing pleased to punish the child. Through the author’s skill of ordering words, we come to learn of Gram’s twisted reasons behind the turmoil she causes Skyla. Other worthy characters stand out: Gene, the dud of a father, and the two sisters that torment Skyla, and Clarice, the mean reflection to Skyla’s innocence. Orange Petals in a Storm first led me to believe the title had to do with a collection of prose, since the author, Niamh Clune, is a well-known poet. In 2002, she earned a PhD from Surrey University, UK, in "Acquiring Wisdom through the Imagination." She is also the author of the recently published, The Coming of the Feminine Christ. I suspect that her educational background is the reason her characters leap off the pages, allowing her to enhance on the very important question of ‘why’ her characters act as they do. All readers walk the hero's journey--a quest of discovery--and I found this especially true when reading Niamh Clune's Orange Petals in a Storm. The action begins dramatically--an eleven-year-old girl running away in a rainstorm, escaping the slow death of a cold and unforgiving home to be received by the cold, unforgiving torrent of a winter storm. A symbolic sort of thing, I thought, and well done. The book then moves away from the immediate storm and into the minds of the main characters, a def All readers walk the hero's journey--a quest of discovery--and I found this especially true when reading Niamh Clune's Orange Petals in a Storm. A symbolic sort of thing, I thought, and well done. The book then moves away from the immediate storm and into the minds of the main characters, a definite change of pace which gave me pause. As I continued, I realized that much of the novel was going to be focused on the inside workings of the characters' minds rather than limiting the focus to action. Author Niamh Clune is "a writer, teacher, spiritual psychologist, award-winning social entrepreneur, environmental campaigner and award-winning writer of songs." Orange Petals in a Storm reads in places much like The Celestine Prophecy and in other parts of the novel reads somewhat like the medieval morality play Everyman. This novel is an allegory, a myth, a fantasy, and a sociological and psychological study. It contains boys who are cats, Threads of Prophesy, and families with histories of generations of repeated trauma and abuse. It is a beautiful story of hope, and a chronicle of the ugliness of the world. It is the story of Skyla McFee, an orphan at eleven years of age, a brave and mystical child thrown into an unknown world. Clune's message that we structure our own realities and that we are in control of our own fates--that the outer depends on the inner--structures this tale and is the wellspring of its power. The book has its weaknesses. Although the novel is generally proofread well, there are lapses in the use of the past perfect tense, requiring the reader to determine if the narrative is part of the current storyline or a digression into the past. (Or is this a deliberate democratization of the experience of time?) There are also moments of extended explanation where the "inner novel" becomes summary or overview. This is not a long novel, though, and Dr. Clune's description of mental experience with concrete imagery is an over-riding and reassuring presence. Clune's symbolic representation of Skyla's descent into her mystical self, beginning about halfway through the novel where we are introduced to The Chair and then The Door and then The Room, is a fantastic journey of the imagination and a symbolic representation of one individual's search within herself for the power and purpose of her life. The mythic and psychological representation of color and the primary elements are skillfully woven into the story. If you are looking for a satisfactory resolution of the conflicts of life, then Orange Petals in a Storm ends well. It was a real pleasure to follow Skyla as she searched within herself for the power to meet her challenges--and it was especially satisfying to be with her as she discovered that helping herself also meant helping others, healing herself also meant healing others. Read this novel as a journey of the blending of inner and outer realities, of the blending of fact and myth. The world is as we are. Find yourself within and then give yourself to the world. We grow with the giving. Note: Since writing this novel, Niamh Clune has contacted me and stated that the novel has received further editing. Based on that information, I have given a "four-star" rating. I didn't know what to expect when I bought this book. The title and cover are lovely but didn't even really hint that this was a story of magic and wonder. The first few lines of the book draw you quickly into the story of a sympathetic and lovely little girl who is more sad and lonely than any child should ever be, and you quickly come to care for her and fear for her life. I want to tell you what happens to her and the wonderful cat she befriends and the . . .but wait, the author does a wonderf I didn't know what to expect when I bought this book. The title and cover are lovely but didn't even really hint that this was a story of magic and wonder. The first few lines of the book draw you quickly into the story of a sympathetic and lovely little girl who is more sad and lonely than any child should ever be, and you quickly come to care for her and fear for her life. I want to tell you what happens to her and the wonderful cat she befriends and the . . .but wait, the author does a wonderful job with this herself. Wonderfully engaging story about a young girl and the beautiful gifts she discovers she has to get herself through some very tough times. It could have been twice as long and I still would have read it in two days! This was a sweet, allegorical story of a young girl coping with a rotten living situation. But perhaps due to the allegorical nature of the book, all the characters and events seemed like plot devices rather than real people or real happenings and I found it hard to really connect. A sweet story, in which the power of the imagination transforms the harsh life of a young girl into something worth living and pursuing. Beautifully told! Orange Petals in a Storm is the first in the series following the life of Skyla McFee written by Niamh Clune. We meet 11-year-old Skyla McFee who through tragic circumstances is living with her stepfather and his family. Unloved and ignored Sklya runs away but no further than her old home she once shared with her beloved Mother and Father. Such happy times now seem such a distant memory. 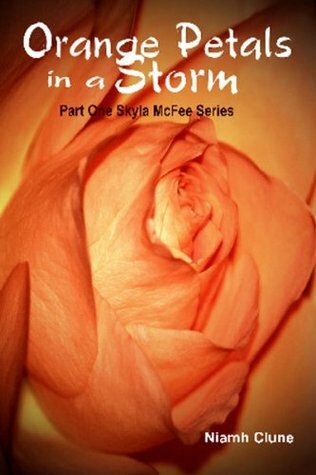 Fighting with the elements and sorrow for what she has lost she find herself transported into an inner world wh Orange Petals in a Storm is the first in the series following the life of Skyla McFee written by Niamh Clune. Fighting with the elements and sorrow for what she has lost she find herself transported into an inner world where life becomes clearer with the help of Mick the Cat and the Treads of Prophecy she sets upon helping the least likely of people. Can Skyla change the circle of life for a family? Can she survive long enough to find happiness in her own world? This is a very short novel and I read it cover to cover in just a few hours. I didn’t know what to expect from this book. As anyone who regularly reads my book reviews will know, despite trying, I have difficulties big time with anything that is not physical on this earth or not real (in the human form), yet again, I have found a book that has puzzled me! I adored the story of Skyla, the struggles she endured and felt that Niamh had written a beautifully poignant tale of this little girl’s early life. I loved all the descriptive text around her feeling, her surroundings and relationships with the people around her. My heart went out to her and wanted so much for things to turn out right for her. Elements of the story made me think of a very modern Cinderella due to the life Skyla had. Forgive me for being honest, I struggled with the parts of the story that transported Skyla into the inner world and spiritual lands. This has nothing to do with the brilliantly written story by Niamh but more about the limitations of the boundaries that my brain can stretch. I am so glad I read this story, Skyla is an adorable little lady and I’m thrilled that this is just part one of a series for her, I certainly would like to see where Niamh takes her in the next edition. Thank you so much Niamh for sending me a copy of your novel. When you open this book, you find a child in dire straits. She is running in the rain, back to her beloved former home, only to succumb to the cold before reaching freedom. Young Skyla McFee is trapped in a situation that no child should ever endure, that of a cold family who cares little for her following the death of her mother. However Skyla is a survivor, and she soon learns that she has a gift. What the horrible Roche family views as her escaping reality and turning to her imagination is ac When you open this book, you find a child in dire straits. She is running in the rain, back to her beloved former home, only to succumb to the cold before reaching freedom. Young Skyla McFee is trapped in a situation that no child should ever endure, that of a cold family who cares little for her following the death of her mother. However Skyla is a survivor, and she soon learns that she has a gift. What the horrible Roche family views as her escaping reality and turning to her imagination is actually Skyla learning that she is a powerful and gifted girl with the ability to ease the pain in others, including the child who once bullied her. This is not an action-packed, fast-paced story, where every scene follows one after another like a bullet from a gun. Rather it is a soft story, full of mysticism and guidance - a modern-day fairytale for our youth. I almost had the feeling that the characters in her dream world were whispering the entire time. This story would be perfect for reading aloud, with just enough fantasy in it to hold a child captive. It is a touching and poetically written story with a strong and hopeful message. Evil will never triumph over good. Skyla does not succumb to despair, and her optimism is rewarded. It ends on a glimmer of hope, and I’m sure in book two we will see her become even stronger and more powerful! I have a daughter, and I could very easily see myself passing it on to her to read. Not only for the lovely fantasy weaved into it, but also for the message of never giving in or giving up and standing tall for what you believe in. I think we may read this together soon! Orange Petals in a Storm is the story of an eleven year old girl who has been mistreated by her stepfather since her mother’s death one year ago. On an external level, it’s a simple story about her life turning around, but it’s the inner world that gives this story its magic. To handle the abuse, the girl sits in an old chair—all that she has left of her mother—and withdraws into her mental ‘safe room’. There, she meets the human male version of the cat that saves her when she runs away and nearl Orange Petals in a Storm is the story of an eleven year old girl who has been mistreated by her stepfather since her mother’s death one year ago. On an external level, it’s a simple story about her life turning around, but it’s the inner world that gives this story its magic. To handle the abuse, the girl sits in an old chair—all that she has left of her mother—and withdraws into her mental ‘safe room’. There, she meets the human male version of the cat that saves her when she runs away and nearly freezes to death in a storm. With him—and sometimes an old woman—as her guide she travels the web of light that makes up the connections of the inner world. The confidence and wisdom she gains from her inner travels empowers her actions in the outer world. The inner experiences are too detailed and beautifully written for me to do them any justice in a description. It’s better you simply read the story yourself. The book is expertly crafted, the prose beautiful and the characters well drawn. I highly recommend the book for anyone interested in magical realism, metaphysical or visionary fiction. This story follows Skyla as she is trying to cope with the loss of her mother. She has to live with her mother's partner, his mother and his two children and an environment that is deeply unpleasant. Skyla learns how to enter a fantasy world which helps her detach from her home environment and also allows her to help her school bully's home situation. In the end of the book Skyla ends up happily living with her aunt. In my opinion this book is unfortunately just not my type, I think it didn't reac This story follows Skyla as she is trying to cope with the loss of her mother. She has to live with her mother's partner, his mother and his two children and an environment that is deeply unpleasant. This book is one of those that stays with you because of the main character, Skyla. She is dealing with personal hardship and is given strength. loved her perseverance and desire to make her life better. The book shows you as the reader that there are alternatives to take to get you out of situations. The rich prose and compelling story of a young girl with spiritual power makes for a great debut to this series. Highly recommended. A cute tale that starts out like a Cinderella, and becomes more about magic in your chakras.